The name is derived from medieval Latin word aequator, in the phrase circulus aequator diei et noctis, meaning ‘circle equalizing day and night’, from the Latin word aequare meaning ‘make equal’. Earth bulges slightly at the Equator; the "average" diameter of Earth is 12,750 km (7,920 mi), but the diameter at the Equator is about 43 km (27 mi) greater than at the poles. Sites near the Equator, such as the Guiana Space Centre in Kourou, French Guiana, are good locations for spaceports as they have a faster rotational speed than other latitudes; the added velocity reduces the fuel needed to launch spacecraft. Since Earth rotates eastward, spacecraft must also be launched eastward (if not, to the southeast or northeast) to take advantage of this Earth-boost of speed. The precise location of the Equator is not truly fixed; the true equatorial plane is perpendicular to the Earth's spin axis, which drifts about 9 metres (30 ft) during a year. This effect must be accounted for in detailed geophysical measurements. The International Association of Geodesy (IAG) and the International Astronomical Union (IAU) have chosen to use an equatorial radius of 6,378.1366 kilometres (3,963.1903 mi) (codified as the IAU 2009 value). This equatorial radius is also in the 2003 and 2010 IERS Conventions. It is also the equatorial radius used for the IERS 2003 ellipsoid. If it were really circular, the length of the Equator would then be exactly 2π times the radius, namely 40,075.0142 kilometres (24,901.4594 mi). The GRS 80 (Geodetic Reference System 1980) as approved and adopted by the IUGG at its Canberra, Australia meeting of 1979 has an equatorial radius of 6,378.137 kilometres (3,963.191 mi). The WGS 84 (World Geodetic System 1984) which is a standard for use in cartography, geodesy, and satellite navigation including GPS, also has an equatorial radius of 6,378.137 kilometres (3,963.191 mi). For both GRS 80 and WGS 84, this results in a length for the Equator of 40,075.0167 km (24,901.4609 mi). Average annual temperatures in equatorial lowlands are around 31 °C (88 °F) during the afternoon and 23 °C (73 °F) around sunrise. Rainfall is very high away from cold current upwelling zones, from 2,500 to 3,500 mm (100 to 140 in) per year. There are about 200 rainy days per year and average annual sunshine hours are around 2,000. Despite high year-round sea level temperatures, some higher altitudes such as the Andes and Mount Kilimanjaro have glaciers. The highest point on the Equator is at the elevation of 4,690 metres (15,387 ft), at 0°0′0″N 77°59′31″W﻿ / ﻿0.00000°N 77.99194°W, found on the southern slopes of Volcán Cayambe [summit 5,790 metres (18,996 ft)] in Ecuador. This is slightly above the snow line and is the only place on the Equator where snow lies on the ground. At the Equator the snow line is around 1,000 metres (3,300 ft) lower than on Mount Everest and as much as 2,000 metres (6,600 ft) lower than the highest snow line in the world, near the Tropic of Capricorn on Llullaillaco. There is a widespread maritime tradition of holding ceremonies to mark a sailor's first crossing of the Equator. In the past, these ceremonies have been notorious for their brutality, especially in naval practice. Milder line-crossing ceremonies, typically featuring King Neptune, are also held for passengers' entertainment on some civilian ocean liners and cruise ships. ^ "Definition of equator". OxfordDictionaries.com. Retrieved 5 May 2018. ^ "Equator". National Geographic - Education. Retrieved 29 May 2013. ^ Instituto Geográfico Militar de Ecuador (24 January 2005). "Memoria Técnica de la Determinación de la Latitud Cero" (in Spanish). ^ "Weather Information for Macapa". ^ "Weather Information for Pontianak". ^ "Weather Information for Libreville". The 45th parallel north is a circle of latitude that is 45 degrees north of Earth's equator. It crosses Europe, Asia, the Pacific Ocean, North America, and the Atlantic Ocean. The 45th parallel north is often called the halfway point between the Equator and the North Pole, but the true halfway point is actually 16.0 km (9.9 mi) north of the 45th parallel because Earth is an oblate spheroid; that is, it bulges at the equator and is flattened at the poles.At this latitude, the Sun is visible for 15 hours 37 minutes during the summer solstice, and 8 hours 46 minutes during the winter solstice. The midday Sun stands 21.6° above the southern horizon at the December solstice, 68.4° at the June solstice, and exactly 45.0° at either equinox. The 45th parallel south is a circle of latitude that is 45° south of the Earth's equator. It is the line that marks the theoretical halfway point between the equator and the South Pole. The true halfway point is 16.2 km (10.1 mi) south of this parallel because Earth is not a perfect sphere, but bulges at the equator and is flattened at the poles.Unlike its northern counterpart, almost all (97%) of it passes through open ocean. It crosses the South Atlantic Ocean, the Indian Ocean, Australasia (New Zealand and just south of Tasmania), the Southern Ocean, and Patagonia. At this latitude, daytime lasts for 15 hours, 37 minutes during the December solstice and 8 hours, 46 minutes during the June solstice. The 60th parallel north is a circle of latitude that is 60 degrees north of Earth's equator. It crosses Europe, Asia, the Pacific Ocean, North America, and the Atlantic Ocean. Although it lies approximately twice as far away from the Equator as from the North Pole, the 60th parallel is half as long as the Equator line. This is where the Earth bulges halfway as much as on the Equator. At this latitude, the Sun is visible for 18 hours, 52 minutes during the June solstice and 5 hours, 52 minutes during the December solstice. The maximum altitude of the Sun is 53.44° on 21 June and 6.56° on 21 December.The lowest latitude where white nights can be observed is approximately on this parallel. These, by definition, are the most globally visible constellations. Celestial bodies other than Earth also have similarly defined celestial equators. Circles of latitude are often called parallels because they are parallel to each other; that is, any two circles are always the same distance apart. A location's position along a circle of latitude is given by its longitude. Circles of latitude are unlike circles of longitude, which are all great circles with the centre of Earth in the middle, as the circles of latitude get smaller as the distance from the Equator increases. Their length can be calculated by a common sine or cosine function. The 60th parallel north or south is half as long as the Equator (disregarding Earth's minor flattening by 0.3%). A circle of latitude is perpendicular to all meridians. The latitude of the circle is approximately the angle between the Equator and the circle, with the angle's vertex at Earth's centre. The equator is at 0°, and the North Pole and South Pole are at 90° north and 90° south, respectively. The Equator is the longest circle of latitude and is the only circle of latitude which also is a great circle. There are 89 integral (whole degree) circles of latitude between the equator and the Poles in each hemisphere, but these can be divided into more precise measurements of latitude, and are often represented as a decimal degree (e.g. 34.637°N) or with minutes and seconds (e.g. 22°14'26"S). There is no limit to how precisely latitude can be measured, and so there are an infinite number of circles of latitude on Earth. On a map, the circles of latitude may or may not be parallel, and their spacing may vary, depending on which projection is used to map the surface of the Earth onto a plane. On an equirectangular projection, centered on the equator, the circles of latitude are horizontal, parallel, and equally spaced. On other cylindrical and pseudocylindrical projections, the circles of latitude are horizontal and parallel, but may be spaced unevenly to give the map useful characteristics. 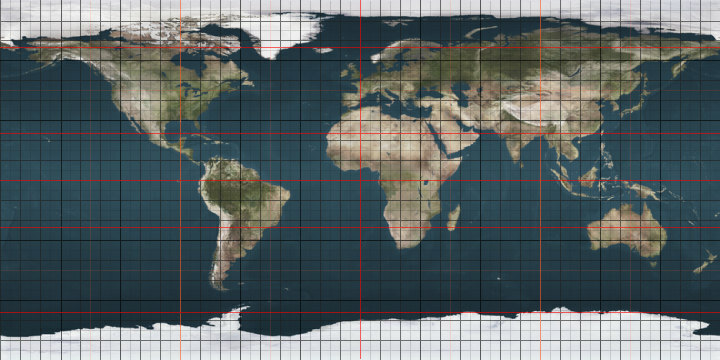 For instance, on a Mercator projection the circles of latitude are more widely spaced near the poles to preserve local scales and shapes, while on a Gall–Peters projection the circles of latitude are spaced more closely near the poles so that comparisons of area will be accurate. On most non-cylindrical and non-pseudocylindrical projections, the circles of latitude are neither straight nor parallel. Arcs of circles of latitude are sometimes used as boundaries between countries or regions where distinctive natural borders are lacking (such as in deserts), or when an artificial border is drawn as a "line on a map", which was made in massive scale during the 1884 Berlin Conference, regarding huge parts of the African continent. North American nations and states have also mostly been created by straight lines, which are often parts of circles of latitudes. For instance, the northern border of Colorado is at 41°N while the southern border is at 37°N. Roughly half the length of border between the United States and Canada follows 49°N. Decimal degrees (DD) express latitude and longitude geographic coordinates as decimal fractions and are used in many geographic information systems (GIS), web mapping applications such as OpenStreetMap, and GPS devices. Decimal degrees are an alternative to using degrees, minutes, and seconds (DMS). As with latitude and longitude, the values are bounded by ±90° and ±180° respectively. 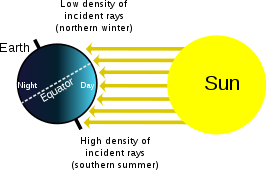 Positive latitudes are north of the equator, negative latitudes are south of the equator. Positive longitudes are east of Prime meridian, negative longitudes are west of the Prime Meridian. Latitude and longitude are usually expressed in that sequence, latitude before longitude. The root of the word declination (Latin, declinatio) means "a bending away" or "a bending down". It comes from the same root as the words incline ("bend toward") and recline ("bend backward").In some 18th and 19th century astronomical texts, declination is given as North Pole Distance (N.P.D. ), which is equivalent to 90 - (declination). For instance an object marked as declination -5 would have a NPD of 95, and a declination of -90 (the south celestial pole) would have a NPD of 180. A geographic coordinate system is a coordinate system that enables every location on Earth to be specified by a set of numbers, letters or symbols. The coordinates are often chosen such that one of the numbers represents a vertical position and two or three of the numbers represent a horizontal position; alternatively, a geographic position may be expressed in a combined three-dimensional Cartesian vector. A common choice of coordinates is latitude, longitude and elevation. To specify a location on a plane requires a map projection. The Intertropical Convergence Zone (ITCZ), known by sailors as the doldrums or the calms, is the area encircling Earth near the Equator, where the northeast and southeast trade winds converge. The ITCZ was originally identified from the 1920s to the 1940s as the "Intertropical Front" ("ITF"), but after the recognition in the 1940s and the 1950s of the significance of wind field convergence in tropical weather production, the term ITCZ was then applied. When it lies near the Equator, it is called the near-equatorial trough. Where the ITCZ is drawn into and merges with a monsoonal circulation, it is sometimes referred to as a monsoon trough, a usage more common in Australia and parts of Asia. In the seamen's speech, the zone is referred to as the doldrums because of its erratic (monotonous) weather patterns with stagnant calms and violent thunderstorms. The ITCZ appears as a band of clouds, usually thunderstorms, that encircle the globe near the Equator. In the Northern Hemisphere, the trade winds move in a southwestward direction from the northeast, while in the Southern Hemisphere, they move northwestward from the southeast. When the ITCZ is positioned north or south of the Equator, these directions change according to the Coriolis effect imparted by Earth's rotation. For instance, when the ITCZ is situated north of the Equator, the southeast trade wind changes to a southwest wind as it crosses the Equator. The ITCZ is formed by vertical motion largely appearing as convective activity of thunderstorms driven by solar heating, which effectively draw air in; these are the trade winds. The ITCZ is effectively a tracer of the ascending branch of the Hadley cell and is wet. The dry descending branch is the horse latitudes. The location of the ITCZ gradually varies with the seasons, roughly corresponding with the location of the thermal equator. As the heat capacity of the oceans is greater than air over land, migration is more prominent over land. Over the oceans, where the convergence zone is better defined, the seasonal cycle is more subtle, as the convection is constrained by the distribution of ocean temperatures. Sometimes, a double ITCZ forms, with one located north and another south of the Equator, one of which is usually stronger than the other. When this occurs, a narrow ridge of high pressure forms between the two convergence zones. In geography, latitude is a geographic coordinate that specifies the north–south position of a point on the Earth's surface. Latitude is an angle (defined below) which ranges from 0° at the Equator to 90° (North or South) at the poles. Lines of constant latitude, or parallels, run east–west as circles parallel to the equator. Latitude is used together with longitude to specify the precise location of features on the surface of the Earth. On its own, the term latitude should be taken to be the geodetic latitude as defined below. Briefly, geodetic latitude at a point is the angle formed by the vector perpendicular (or normal) to the ellipsoidal surface from that point, and the equatorial plane. Also defined are six auxiliary latitudes which are used in special applications. The line-crossing ceremony is an initiation rite that commemorates a person's first crossing of the Equator. The tradition may have originated with ceremonies when passing headlands, and become a "folly" sanctioned as a boost to morale, or have been created as a test for seasoned sailors to ensure their new shipmates were capable of handling long rough times at sea. Equator-crossing ceremonies, typically featuring King Neptune, are common in the navy and are also sometimes carried out for passengers' entertainment on civilian ocean liners and cruise ships. They are also performed in the merchant navy and aboard sail training ships. Throughout history, line-crossing ceremonies have sometimes become dangerous hazing rituals. Most modern navies have instituted regulations that prohibit physical attacks on sailors undergoing the line-crossing ceremony. A location's north–south position along a meridian is given by its latitude, which is approximately the angle between the local vertical and the equatorial plane. If the Earth were perfectly spherical and radially homogeneous, then the longitude at a point would be equal to the angle between a vertical north–south plane through that point and the plane of the Greenwich meridian. Everywhere on Earth the vertical north–south plane would contain the Earth's axis. But the Earth is not radially homogeneous and has rugged terrain, which affect gravity and so can shift the vertical plane away from the Earth's axis. The vertical north–south plane still intersects the plane of the Greenwich meridian at some angle; that angle is the astronomical longitude, calculated from star observations. The longitude shown on maps and GPS devices is the angle between the Greenwich plane and a not-quite-vertical plane through the point; the not-quite-vertical plane is perpendicular to the surface of the spheroid chosen to approximate the Earth's sea-level surface, rather than perpendicular to the sea-level surface itself. Right ascension (abbreviated RA; symbol α) is the angular distance of a particular point measured eastward along the celestial equator from the Sun at the March equinox to the (hour circle of the) point above the earth in question. When paired with declination, these astronomical coordinates specify the direction of a point on the celestial sphere in the equatorial coordinate system. An old term, right ascension (Latin: ascensio recta) refers to the ascension, or the point on the celestial equator that rises with any celestial object as seen from Earth's equator, where the celestial equator intersects the horizon at a right angle. It contrasts with oblique ascension, the point on the celestial equator that rises with any celestial object as seen from most latitudes on Earth, where the celestial equator intersects the horizon at an oblique angle.